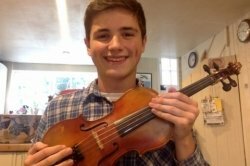 I am a talented and hard working young violinist looking to share my experience and knowledge. I have been playing for over 10 years and am currently a Final Year BMus music student at Newcastle University, where I study with Iona Brown of the Royal Northern Sinfonia. I have received first class results in all my university years, winning the Helen Ferriby prize for best second year music student at Newcastle University. I was the only violinist admitted to an ERASMUS year at the prestigious Catalan Music College in Barcelona (ESMUC), where I was taught by former soloist Eva Graubin. I have played in a huge variety of ensembles - orchestras, quartets, tango bands, jazz bands, musical pit bands- as well as giving many solo performances. Though mainly a classical player, I am interested in a variety of musical styles and am happy to give pop, jazz and folk style violin lessons! I have professional teaching experience assisting children in the John Roan School Orchestra. As a committee member of the Newcastle University Music Society I helped to organise and deliver collective music lessons to children in primary schools around the North East, culminating in various schools coming to the university for a grand showcase event - the society was nominated for a Pride of Newcastle award by the university for this programme. My teaching style is based on the belief that music is best learnt through enjoyment and I tailor my lessons to each student's specific goals and needs. I combine a focus on the technical requirements of the violin with a wider sense of musicianship - developing the ear, music theory and sense of musical personality to help my pupils to become rounded and confident musicians. The methods i use come from my experience with violin teachers as well as reading the works of famous pedagogues such as Simon Fischer and Ivan Galamian. I can adeptly coach students through the graded music system (ABSRM, Trinity) having taken these exams myself, but am also more than happy to teach students outside this framework.